Terrible, terrible. Went there couple of times, every time tipped them but every time had to point them to some things to correct. Today was the worst service. I brought car in cleaner condition then received. Paid for inside and outside car wash. Inside nothing was done except of mats vacuumed. Outside – unbelievable: it needed to be wiped dry, instead car was smeared all over. I asked to fix it but as the result more smears appeared. On top of it the leather seats became greasy and handprints were all over. Decided to take my car out of that place right away. Got there and they were doing repairs on the tracks. I stand infront of the cashier for 10 minutes while he talked on the phone, then when hes done I ask him how much longer until they are done the repairs? If it get my interior cleaned will it be ready for when Im done that? He says "Yeah it will only be 5 more minutes." After the interior cleaning(Which was done very poorly), they were still doing repairs on the track and I had to leave and come back another day. Horrible customer service and a waste of time. First of all when I called them to know if they were open, the lady that answered me was rude and hang up in my face before I had the time to say thanks. When I got there the place is disgusting, my car was not wash properly , they didnt pass the vacuum , they didnt empty the ashtray, they didnt clean the back seats and my windows were full of dust. To be clear, DONT GO THERE! Next time I visit Mississauga, i will try somewhere else for sure. Worst place to get a car wash. Im a guy with low expectations and I was very mad about the result of my car. There was grease all over my window and the floor was poorly vacuumed. They will only do a good job on your car if youre a pretty woman or a friend of the owner. Hell even the free vacuum and coin wash arent working a lot of times. Never again!! It was the worst car wash interior cleaning I have ever received. The place is run by a bunch of Pakis and they do a horrible job with no care what so ever. The service is also very unprofessional, one of their employees was sitting outside looking homeless the entire time I was waiting. Good experience. They do a good job for the price they charge, would totally recommend. Most of the bad reviews I read here are from people that are looking for an outstanding service, but not willing to pay the price for it. You get what you pay for. I have been going there for years and I must say . They are A1 service . as they always take care of me and my family. They clean the cars very will and never leave any thing untouched .the Price is simple and not that high . Decent prices but the place is run down and poorly run. I dont even think there is a difference with their regular washes and premium ones. Just a cash grab. Hand drying is mediocre at best. Miss spots all the time. Terrible place. I usually give companies benefit of doubt when its dirty and rundown. I should have gone with my instinct and walked out. Save yourself the money and go to a decent touchless for $12 and a $2 vacuum. It was very overpriced for the quality of the detailing. It was not good at all, The cup holders where as if nobody even tried to clean it, the drivers floor mat had dirty shoe marks. Never going there again. I have been going there for over 8 years. They do an awesome job.For $25 interior and exterior wash, vacuum and cleaning, its totally worth it! I am yet to find a place as good as this in Mississauga! These guys broke parts off my car, refused to pay me back for them. The owner and the staff are ghetto as hell, they WILL break your car. Bottom line, save your money and dont go there. 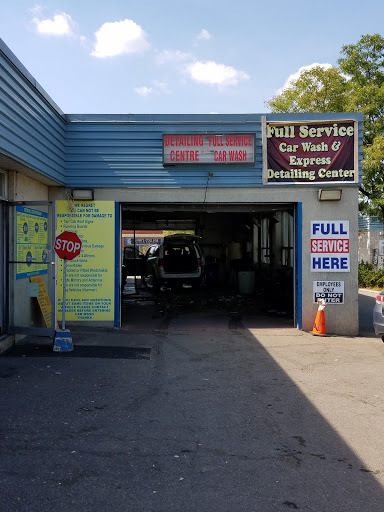 Worst service, did not clean my car good. guys hardly speak english. and use F.... worlds for me. No respect. never coming back. The place is pretty dirty itself, they did a pretty bad job on the car, it was still left dirty. Not worth the money at all. Quick and they do a good job. Same price as any drive through gas station only they hand dry so no spots. Best place ever! Guys are so friendly. Prices are amazing and love the way my car looks every time. Open early. Good service except the "hand dry" I paid extra for, was only the windows and mirrors. Always provides very kind service and has treated me very well over the years. The inside was ok for a rushed job but the outside was still not worth $30. Great place to get your car clean inside and outside with reasonable price. OK to clean your car exterior. You can find better place in else where. Car always comes out clean. Staff is nice so is the owner. Nice service. However, drying car afterwards is poor. Pretty decent car wash/vacuum considering low prices! Great service. Good price . Highly recommended. Damage my Rim. and refuse to talk to me. Good service and was fairly thorough. Free vacuums and $3 power wash. Yeah!